Pure Shetland Wool Smokering ! Sorry for the delay announcing the yarn winner for the booties ( winner was Jennifer Thiele), been so busy & I'm finding it very difficult to keep up the blog entries due to my workload in the mill, the home & barns. Don't get a sit down till 8pm at night & by that time I'm pooped ! Light Grey & Shaela which are all equally lovely & soft. I started knitting these 2 years ago & they sell like hot cakes. 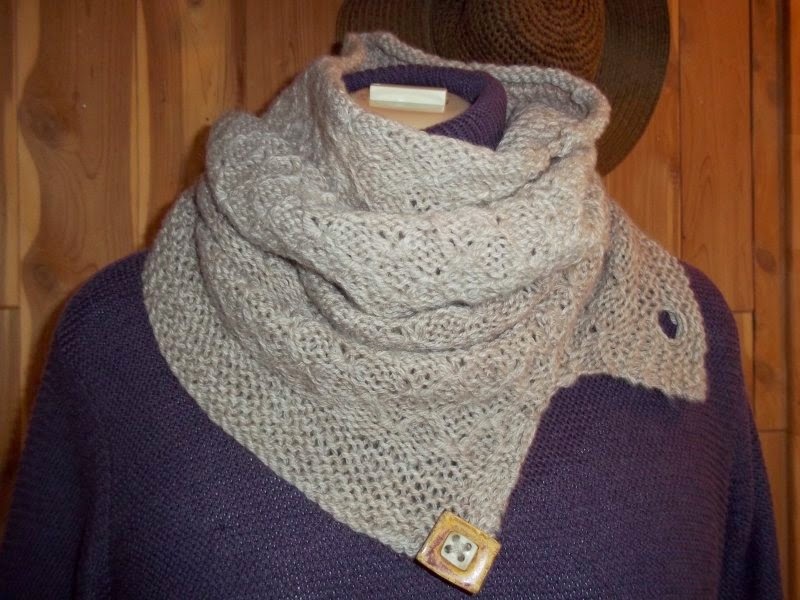 The garment is long enough to cover your head & neck & it looks equally nice worn puddled down around your neck. My Youngest child Kyanna is never without her neck warmer-she says she feels cold when she takes it off ! the slit can be closed with the button if you prefer, the bottom edge is Garter stitch so it lays perfectly flat. 2 winners will be drawn at random on the 30th Novenber 2014, simply tell me what colour you would prefer ! Natural Fawn, Light Grey, Black Or Shaela. Had lots of enquiries from people about when I will design the hat pattern & will I provide it for free on this blog. The Gunnister mans cap is one of the items of clothing that were found on the body of a man who was buried in a peat bog in the Shetland Islands. They believe he dates from 1700. One very interesting thing about the hat is that it has a turned up brim & the stitch type used is not a familiar one because back then they did not use the Purl stitch. So How Was it constructed ? It looks woven but I'm not at all sure about that either. The hat has the beautiful 4 corner Decrease. And another question, did they even knit in the round back then ? I guess i will have to cast on & see where it takes me. Check back for updates & Images of my take on the Gunnister man's cap ! I Hope to have the cap finished before the end of November & the pattern will be included here so if you would like to try to knit the hat add it to the comments section when you place your entry for the smokering & I will drawn the name of one person to knit the cap ! This is an image of the cap, the bottom one with the turned up brim-click on the picture to enlarge. This is what i have so far. Its curling like crazy but i have a plan after washing & blocking to felt the turn up brim in place. I'm very pleased with how the cap looks. I used the needle felting machine to felt down the brim & it worked really well. If you don't have a needle felting machine you can use the clover fine needle felting pen, works on the same principal. & only the cast on edge needs to be felted so its fast ! I think the 4 corner shaping turned out well too. Enlarge the picture to show more detail. 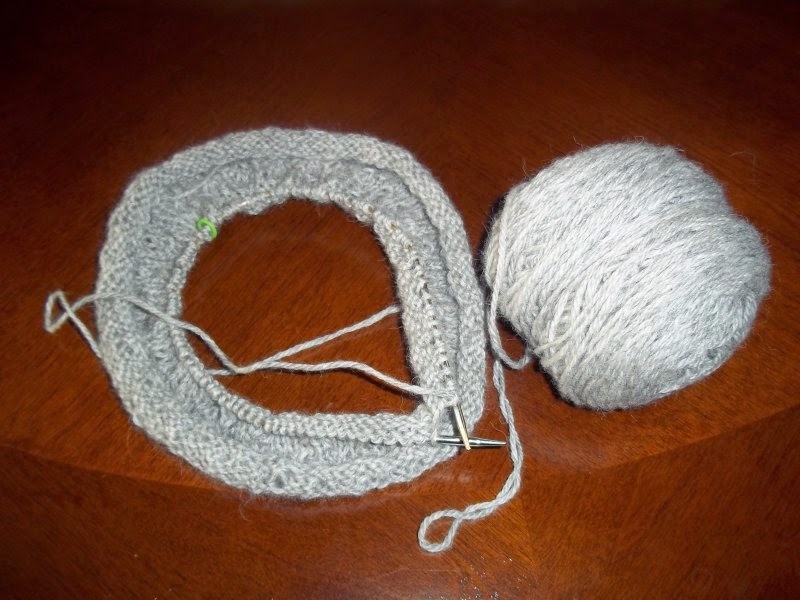 To Knit The Gunnister cap. 70 grams of Shetland wool yarn in a light worsted weight. Cast on 108 sts, join to work in rnd, place marker & knit 1 rnd. Rnd 1: (RS) *k1, p2, yb, m1; rep from *to end of rnd. Rnds 2,3,4, knit all sts. Repeat the 4 rnds above until work measures 4'' inches long. & continue knitting in rnds till work measures 7.5'' inches from Cast on edge. (Set up) slip your 1st st marker, k14, psm,(place stitch marker), k28, psm, k27, psm, k26, psm, k14. sm= stitch marker. Decreases are made at each side of the 4 stitch markers every 2nd round. so you slip your contrast marker, k to within 2 sts of the next marker, k2tog, sm, k2tog; repeat for the other 3 stitch markers. And every alternate rnd knit all sts. decrease in this way until you have 14 sts remaining. Break yarn, gather up remaining sts & sew tail inside work. You may want to also check out my Qiviut blog. 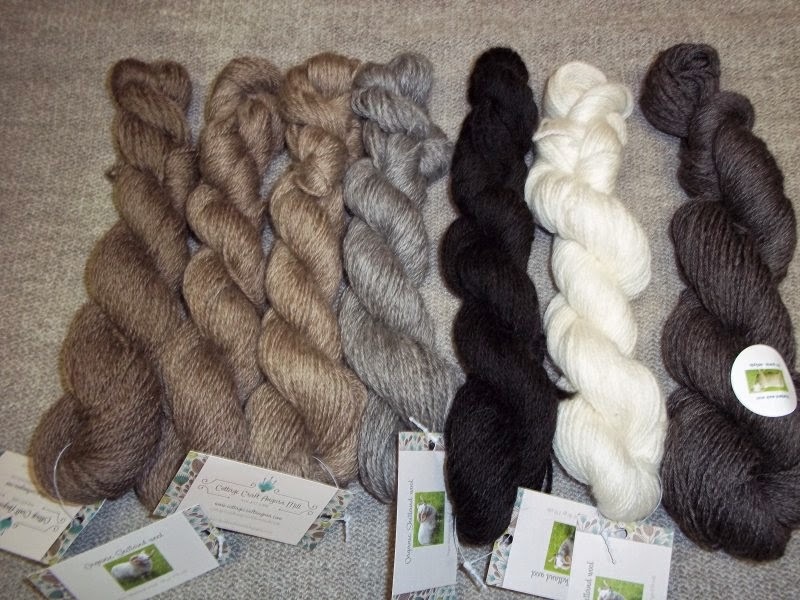 This Month its for a 100 gram skein of 100% Magical qiviut yarn in lace weight with 720 yards & your choice of colour. do you want me to enter you to knit the hat too ? edited entry want to win smoke ring in shaelit. Would love (and wear!) a black smoke ring. I'd like to knit the hat, too! The smoke ring looks fantastic and I'd love to win one! Any of those beautiful colours would be great i think! If I won a smokering I would want to be surprised as to colour. They are all so pretty I couldn't choose! Actually, by that time they were using purl(check out the Eleanor of Toledo stockings), but the only purls I found on this cap were at the brim turn. Since it isn't shown, I made the back of my brim plain. When it's folded down, it looks like a Monmouth cap! I found that a (K1, yo, K2tog) stitch pattern worked out the best. I don't remember the exact row sequence off the top of my head, but the alternating K2tog stitches formed the 'purl bump' look when it was all finished. Thank you for all the information. I cast on & tried the design with k1, k2tog, m1 & the bump was not clear enough so i changed it to k1, p2tog, m1, will have to see if that looks better when i get a few rnds done. 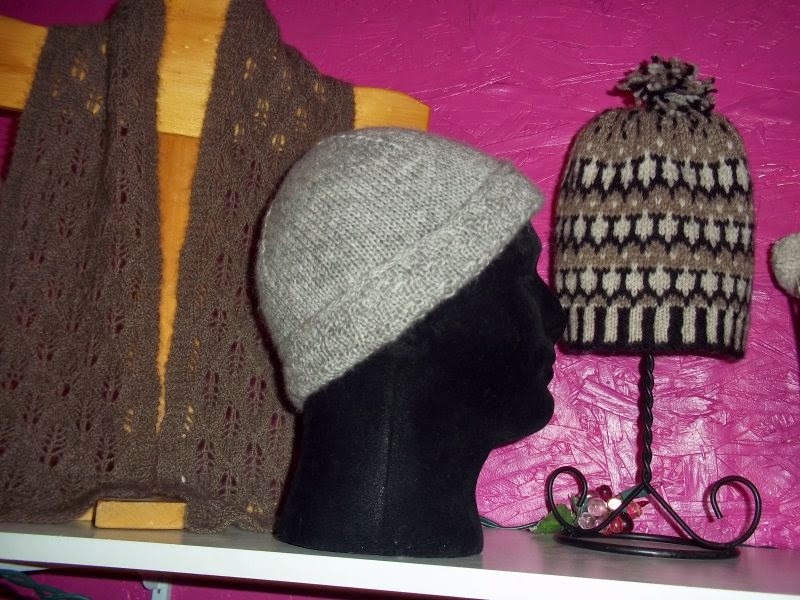 I really love how your grey hat turned out even the shape is lovely ! For the smoke ring I would like it in fawn. I am interested in more information in the man's cap. I would like t knit the cap. Thanks again for a change to win a beautiful smoke ring. I love the color Natural Fawn. 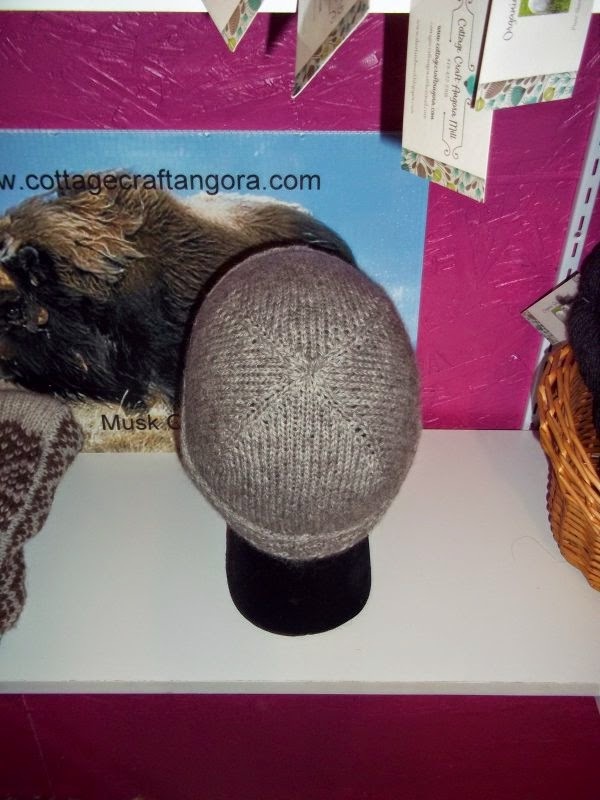 I love to try to knit new and interesting patterns so I am interested in the man's cap. Thank you for the chance! I love Light Grey color the most. The hat would be a perfect Christmas gift for my dad, so count me in. Love the smokering. I think the white is kind of magical looking. Thanks for this chance at one! Love the smoke ring, and the colors all look so good, just surprise me, I'd be happy with any of them. The colour is Shaela....best of Luck with your entry ! The smoke-ring is gorgeous! I think my favourite colour would be the light fawn. The NeckWarmer is beautiful, is there a pattern for that somewhere close by? I like the color of Shaela. And I think I might like to knit that hat too. Stay warm and thank you. Thanks for the HAT pattern..
Oh, I have been planning to make a smokering; it is, sadly, near the bottom of my to-do list so I will not get to it for a while. It would be such a treat to receive one. I think the grey would go best with my coat. Wow Lorraine, you always have the most lovely and generous contests! That smokering looks just so warm and cozy, and I now no longer have mine, ever since my 3 year old daughter decided she adored it and started wearing it everywhere. (She calls it her "Princess-Circle-Scarf".) Really, I love all the colors, but I suppose the Shaela and the Fawn are my favorites. 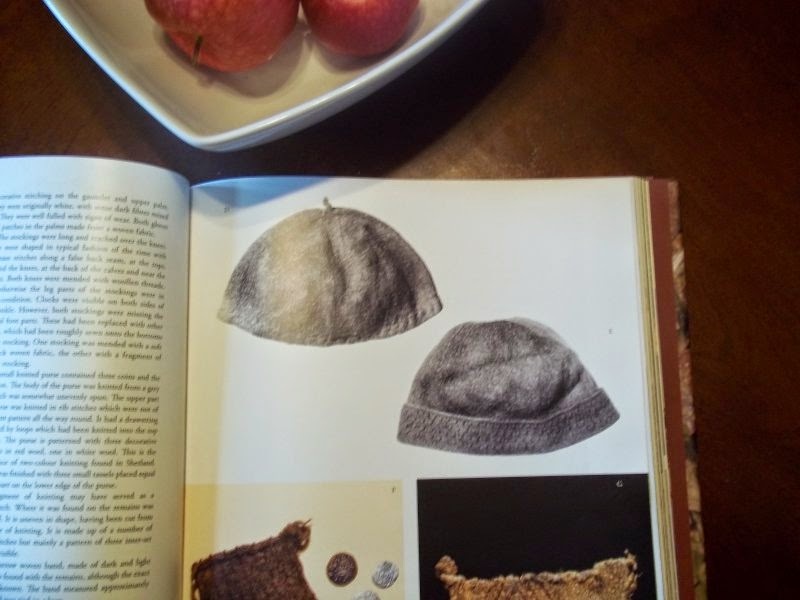 The hat is wonderful too; I really enjoy historical knitting projects. now definitely would love to knit one. The grey is beautiful and I would like to knit the cap too. How can I possibly choose a color when they are all SO lovely!! Natural fawn would go best with my winter coat so thats my choice! :) Love this smokering pattern and the big button is great!! Thank you for the hat pattern. The light grey smoke ring would be lovely.